My husband gave me this book for Christmas--I think it was 2 years ago. In any case, it was long before we had the room or the inclination to raise our own chickens. Ever since we moved here, though, I knew chickens would be coming soon. Not only did we have quite a bit more space out back, we are in much more of a farming community here. Plus, we eat a lot of eggs! Not to mention, it would be a good experience for the kids to raise some animals, and we he had heard that chickens were good for beginner farmers (i.e. city slickers) like us. Well, it has been a good thing I've had this book to fall back on, because we really knew nothing going in. I mean basics, yeah--give them food and water--but details? Not so much. 4 stars: So far so good! This book had been my go-to information source so far. Lofgren starts by defining terms, then he goes into what you need in order to prepare to keep chickens, from choosing a breed to building a coop, avoiding predators, and so on. 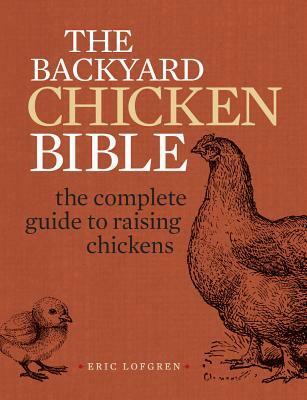 Chapter 3 goes into more depth on starting out with chicks (where my bookmark is currently! ), life stages of chickens, and taking care of the eggs--including incubating and hatching your own if wanted. The following chapters talk about maintaining the flock, and caring for diseases and ailments. Lofgren's conversational tone and anecdotes make it all seem well within reach. His overall message seems to be one of reassurance: chickens are resilient; most likely, it will be okay. It's like an experienced neighbor is leaning over the fence and telling you everything he knows. He has a dry sense of humor, as well, that makes it enjoyable to read beyond just gathering information. As for us, I am happy to report that 2 1/2 weeks in, our chicks are all still alive! The kids are still taking their turns as "chicken helper" willingly. For whatever reason, they have even decided it's fun to change out the wood shavings, so hey, I guess we're doing good on that score! We are now turning their heat lamp off during the day and back on at night, though they are still in the house at this point. We are looking to get them moved outside in the next week--we just need to get the hardware cloth installed around the bottom edge of the coop to stop digging predators from getting in. They are not the cute little balls of fuzz they were at first, but it has been fun to see their feathers start to grow in on their wings and tails. I need to get back to my book to figure out at what point you can tell if you really got all hens or if some are roosters. I mean, I'm sure it will become obvious if or when some start to crow, but it might be nice to know before that point. We've already told the kids that any roosters will be eaten. (The book calls it sending them to Freezer Camp. Ha!) They were okay with that.